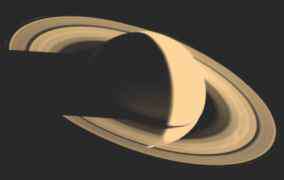 The most prominent feature of Saturn is its ring system, which encircles the planet around its equator. The rings do not touch Saturn. As Saturn orbits the Sun, the rings tilt at the same angle as the equator. Sometimes we see the rings edge-on from Earth and sometimes they are nearly upright. The Voyager space probes showed much more detail about the rings than could be seen from Earth, and four additional rings were discovered, bringing the total to seven. Closer examination of the rings by space probes has revealed they are actually composed of hundreds of narrow, closely spaced 'ringlets'. The closest ring to Saturn is the faint D ring. The inner edge of this ring lies about 6700 km from the cloud tops. The C ring begins at about 14 200 km altitude. The densest of the rings is the B ring, which begins at about 31 700 km above the cloud tops. The Cassini division, which is a gap of about 4700 km in width, is at an altitude of 57 200 km. The gap probably formed as a result of the gravitational pull between ring particles and Saturn's moon Mimas. Beyond this gap, the A ring begins at 76 500 km altitude, followed by the narrow, faint, F ring. Beyond the F ring is the tenuous G ring, discovered by the Voyager space probe, and the even more tenuous E ring (the outermost ring). The bulk of the ring system spans about 275 000 km but it is only about 1.5 km thick. Saturn's rings, unlike the rings of other planets, are very bright because they reflect light. The rings consist of countless small particles, ranging in size from a centimetre to 10 metres across. 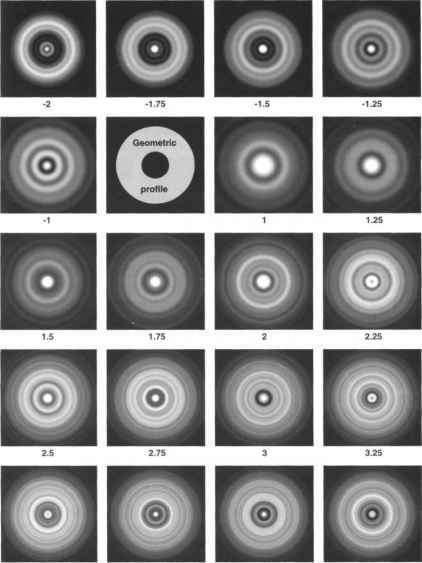 In order to measure the size of the particles in Saturn's rings, scientists measured the brightness of the rings from many angles as the spacecraft flew around the planet. They also measured changes in radio signals received as the craft passed behind the rings. If all the particles were compressed to form a single body, the body would be only about 100 km across. Data from the Voyager spacecraft confirmed that the particles consist of ice and ice-coated rocks. Voyager also identified two tiny satellites, Prometheus and Pandora, each measuring about 50 km across, orbiting Saturn on either side of the F ring. They help to keep the icy particles into a well-defined, narrow band, about 100 km wide. The F ring also contains ringlets that are sometimes braided and sometimes separate. Dark radial 'spokes' that appear and disappear in the B ring are thought to be caused by Saturn's magnetic field. The rings are thought to have formed from a cloud of particles that came from the breakup of a moon or from material that did not combine to form a moon. Moons that orbit within the rings act as shepherd satellites to create sharp edges and gaps between the rings.